All kind of Removal services. Local, National, and International removal service, with specialized personnel. Free quotations. Competitive rates. 24h Service. We guarantee a good service. 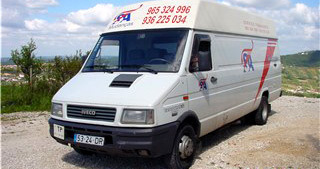 We provide a regular door to door service, from as small as moving a box to as big as moving a large family house, our service is flexible enough to meet all your requirements, ensuring your international removal to or from Portugal or Spain is handled as efficiently and economically as possible. All our vehicles are fitted with satellite tracking, and in-cab telephones for minute-by-minute monitoring and first class security. 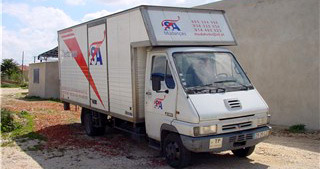 Door to door removals covering household, office, antiques and cars are achieved by road (ferry/tunnel) as a full or part load to or from any of the above countries. Please contact us for further details or to arrange a free no obligation estimate for your removal to or from Portugal or Spain. 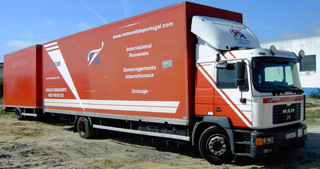 National and International Removals to / from Portugal International Removals to / from UK and all Europe. We cover all the country and Europe. Goupage service. Full or part loads. Our company is equipped with 5 different types of vehicle, small, medium and large with an elevator platform for loading of heavy items. small objects in cartoon boxes. TV’s, stereos, computers, clear sofas, pictures and objects of art are individually packed. Other furniture is usually protected with blankets. However, with a previous agreement, it can be packed in cartoon boxes and / or bubble wrap. What was said in the previous item will be applied here. National moves exclusiveness regimen, when the shipment is over the truck it will set for the delivery destination. Benefit System, the move takes place on the day determined by the costumer and brought for the deposit. The next truck leaving to the delivery place’s area will take the move. All the services are equal to the ones of the direct trip. The difference is that the stated period is longer and the price is lower. Please consult “Transportes Senhora da Agonia” about the possibility of the destination city being on the same way. The procedures are the same ones mentioned above. They can be made by land, for the countries of the European Union. Regular services to all European countries. TSA Removals and storage established since 1996 and since the year 2001 the company has successfully traded and since then it`s well knowed by it´s capacity to offer removal services to and from Portugal and Spain at competitive rates. TSA Removals are experts in European removals and short and long distance property removals to many locations across Europe. Our main activities include a full domestic and commercial international removals service for client removals to Portugal and Spain, removals to France, removals to and from UK, removals to and from Germany, Italy, Belgium, Netherlands and also Sweden, Denmark Finland and Norway . 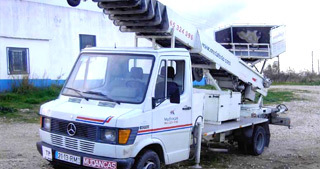 We operate and manage complete removal and storage facilities in Portugal. As the overseas removal expands, we have regular groupage and full loads to USA, Canada, New Zealand and Australia among other overseas destinations. The mission of the company has always been to deliver a superior quality commercial and domestic international removals and Storage service along with a competitive price tag giving the customer a complete satisfactory service. We offer full or part loads and for all European Countries. On the moving day our team initiates their work with the preparation and packing of all goods, such as furniture, ware, books, decorative objects, pictures, works of art, pianos, safes, appliances, clothes and others, in every case using the correct packing material to provide adequate protection for each item. The 24 hours service is your delivery with all the traditional requirements of express delivery. is a company specialized in all kinds of removals. Local Removals | National Moving | International Moving | Moving Express 24. We have several teams in transit throughout the country and also with regular service in several countries in Europe, etc.. Since 1986, and ever ready to carry what you need where necessary. 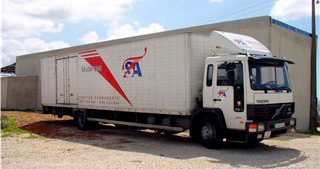 Transport Senhora da Agonia, Ltd is a leading sector of national and international removals and storage furniture. With nearly 20 years of experience, our company’s core values are professionalism, trying to provide all services with maximum quality and competitive prices, aiming at customer satisfaction. We have the ability to adapt to the particular needs of each client by adjusting n / budgets and services individually to each. We have temporary storage and furniture stores where the customer only pays for the space it occupies. We also have service removals under the groupage or public transport between cities with great distance between themselves in order to optimize routes and provide better prices for the customer. Contact us for more information about this service. We make the all types of deliveries Regular service To/From all European countries. TSA – Removals, removals United Kingdom, relocation, Regular Removals to England, Regular Removals to United Kingdom, Moving, Storage. is a company specialized in all kinds of removals. Local Removals | National Moving | International Moving | Moving Express 24. 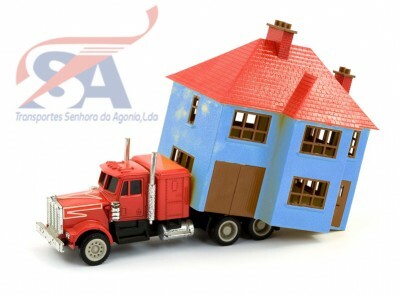 Transportes Senhora da Agonia, Lda storage furniture. We can offer loose storage or full packing case storage boxes which come in different sizes to suit your needs. Both warehouses are operated by our own experienced English and Portuguese speaking staff and we have loading bays to enable Portugal Removals to either load or unload export containers for Worldwide Shipping. We will assist with any storage needs that you the customer may have, short or long term. 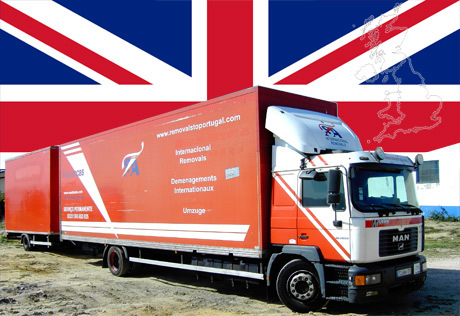 Regular door-to-door service for local, national and international removals, full or part load removals throughout from Portugal to and from Europe. We covers household goods, offices, antiques and cars. Moving services worldwide, Customs Clearance and storage. The move of your company or residence begins with the contact and description of the goods to be carried. When necessary, a visit by a qualified member of our staff will be arranged to check the inventory, of belongings to carry and the packing requirements. Our services and items carried are fully insured. This comprehensive insurance is given so that our clients may be sure that their possessions are adequately covered whilst in the possession of our company.